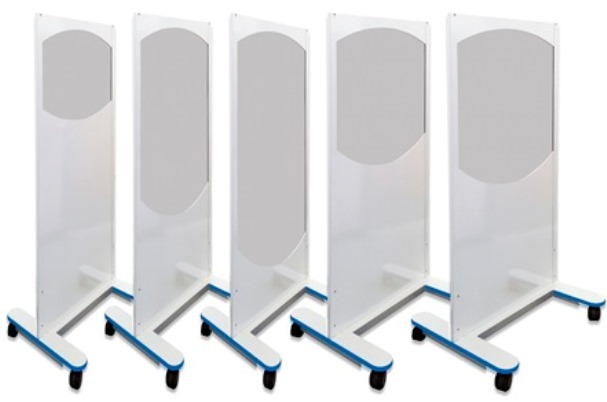 Wolf's Clear Lead® Mobile X-Ray Barriers provide a full-body shield for the doctor or radiologic technologist. The optically clear, lead-plastic panel provides exceptional visibility. The shatter resistance and durability of Clear Lead ensures long life under heavy use. The Clear Lead window rests on an opaque lower panel and smooth-rolling casters allow the barrier to be easily positioned or moved from room to room. The 30 inch Clear Lead® Mobile X-ray barrier can safely protect one or two people. The upper Clear Lead section provides 0.5mm lead equivalency protection. The lower opaque panel provides 0.8mm LEP. The 30 inch barriers are offered in 3 window heights: 24", 48" and 54.5". Shipping lead time = 2-4 weeks. The 48 inch Clear Lead® x-ray barrier can safely protect two or three people. The 56600 standard Barrier has a 30"H x 48"W Clear Lead plastic panel that provides 0.5mm LEP and an opaque lower panel that provides 0.8mm LEP. The 56605 Deluxe Barrier has a 36"H x 48"W Clear Lead plastic panel that provides 1.0mm LEP and a lower opaque panel that provides 1.5mm LEP. Shipping lead time = 4-6 weeks.